Built in 1925, the former Forbes Building at 60-62 Fifth Avenue was designed by Carrère and Hastings, the renowned Beaux Arts firm whose best known building on the avenue is undoubtedly the New York Public Library; at 60-62 Fifth they worked in conjunction with the firm of Shreve and Lamb, two partners who later went on to found the firm that designed another Fifth Avenue landmark, the Empire State Building. The resulting design for the Forbes Building seems halfway between these two better-known works, merging the Roman-influenced classicism of the Library with the severe Cubistic forms of the ESB. The building was originally constructed for the Macmillan Company, the distinguished publishing firm, the southernmost of many similar businesses located on Fifth between 12th and 23rd Streets. As the home of Forbes Magazine, the building also housed the delightfully eccentric collection of the late Malcolm Forbes, which included Faberge Easter eggs and antique toy soldiers. Although much of Malcolm Forbes’ collection has been dispersed, the Forbes Galleries have continued as a jewel-box art space under the leadership of Christopher “Kip” Forbes, Malcolm’s son. 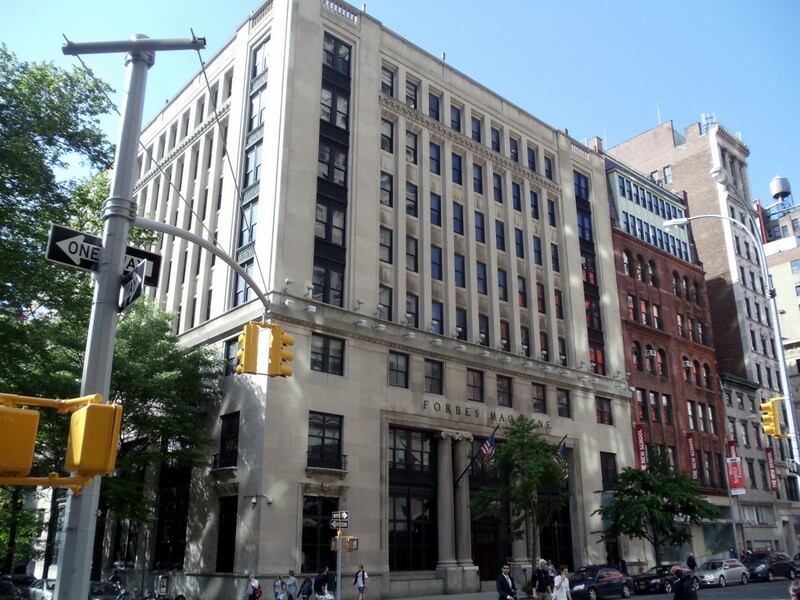 The Forbes Building itself has been recently sold to NYU with the last gallery shows closing November 14th of this year. Whatever its new use may be, it remains a solid presence on the street: the detailing of the double entrance is especially fine.